Use Job Tracking for ArcGIS Server to access information about jobs through an easy-to-use Web application on the desktop or in the field. 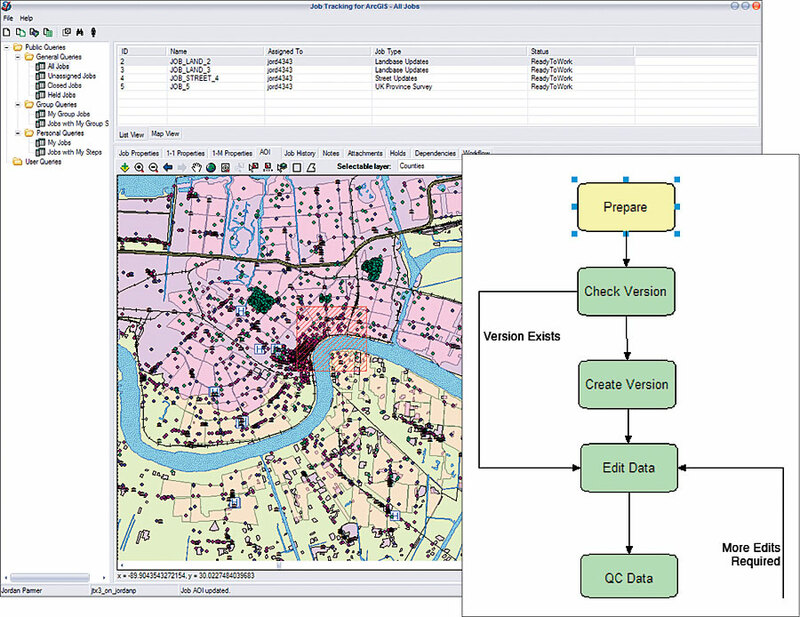 Job Tracking for ArcGIS (JTX)an extension to both ArcGIS Desktop and ArcGIS Serveris a workflow system for GIS applications (e.g., mapping, spatial analysis, data management). 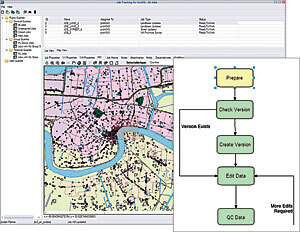 The extension organizes GIS tasks, such as collaborative projects where parts of a GIS job need to be broken down and performed systematically by a group of people. The benefits of using Job Tracking for ArcGIS (JTX) include standardization, better communication/collaboration, consistent reporting, project tracking, and considerable cost savings in typical GIS workflows. Job Tracking for ArcGIS (JTX) works by first breaking down a GIS job into a sequence of tasks (compile data, digitize, update, perform QA/QC, make a map, etc.). This is done with a graphic diagramming tool similar to ModelBuilder. Each task in the workflow is described, including data and software to be used. After defining a workflow, a manager can assign each task in the workflow to an individual who may carry it out for a specific geography. The software guides users through the job steps and automatically brings up the appropriate applications and datasets for each task with supporting information about what is to be done. At the heart of Job Tracking for ArcGIS (JTX) is a database that tracks the progress of these job assignments and reports information to managers on status and performance, without slowing the production process. Esri customers have been successfully using Job Tracking for ArcGIS (JTX) on the desktop to better manage their workflows for both GIS and non-GIS tasks. The availability of this extension for ArcGIS Server improves efficiency by providing greater access to the information within different departments in an organization and even remotely. Users access the Job Tracking for ArcGIS Server extension capabilities through an easy-to-use Web application on the desktop or in the field. Depending on their role in the organization, authorized users can create a job, assign it, work on it, and check its progress. The application can also be set to automatically send e-mail notifications at points in the process defined by the user. In addition, the Job Tracking for ArcGIS (JTX) extension supports map compilation and production workflows (see the special section "GIS for National Mapping and Cartographic Publishing"). For more information, visit www.esri.com/jobtracking, call Esri at 1-800-447-9778, call your Esri regional office, or contact your local Esri reseller. Outside the United States, contact your local Esri distributor.